Start off your visit on the 10th (Thu): stroll through Al Foster Memorial Trail, explore and take pictures at Missouri Botanical Garden, then stop by Bissinger's Handcrafted Chocolatier, and finally take in the architecture and atmosphere at Cathedral Basilica of Saint Louis. Keep things going the next day: tour the pleasant surroundings at Rock Hollow Trial, grab your bike and head to Wildwood Community Park, and then explore by horseback at Edgar M. Queeny County Park. To see photos, reviews, maps, and other tourist information, go to the Saint Louis online tour planner . New York City to Saint Louis is an approximately 16.5-hour car ride. You can also take a bus; or take a train. The time zone changes from Eastern Standard Time (EST) to Central Standard Time (CST), which is usually a -1 hour difference. Traveling from New York City in October, you can expect nighttime temperatures to be a bit cooler in Saint Louis, with lows of 49°F. Wrap up your sightseeing on the 11th (Fri) to allow time to travel to Paris. Start off your visit on the 12th (Sat): shop like a local with words and things and then look for gifts at Leon Bulle. 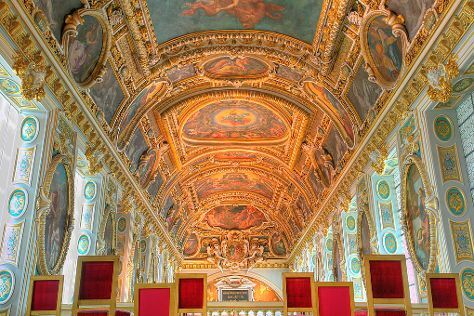 Get ready for a full day of sightseeing on the 13th (Sun): explore the historical opulence of Chateau de Vaux-le-Vicomte, steep yourself in history at Chateau de Rosa Bonheur, then step into the grandiose world of Chateau de Fontainebleau, and finally make a trip to Ile Saint-Louis. To see photos, ratings, maps, and tourist information, refer to the Paris online vacation planner . Fly from Saint Louis to Paris in 14.5 hours. Alternatively, you can do a combination of bus and flight. The time zone difference when traveling from Saint Louis to Paris is 7 hours. Expect a bit cooler weather when traveling from Saint Louis in October: highs in Paris hover around 62°F, while lows dip to 48°F. Finish your sightseeing early on the 14th (Mon) to allow enough time to travel back home.